Harold Diamond now has a hefty bank account to go along with his sparkly last name. 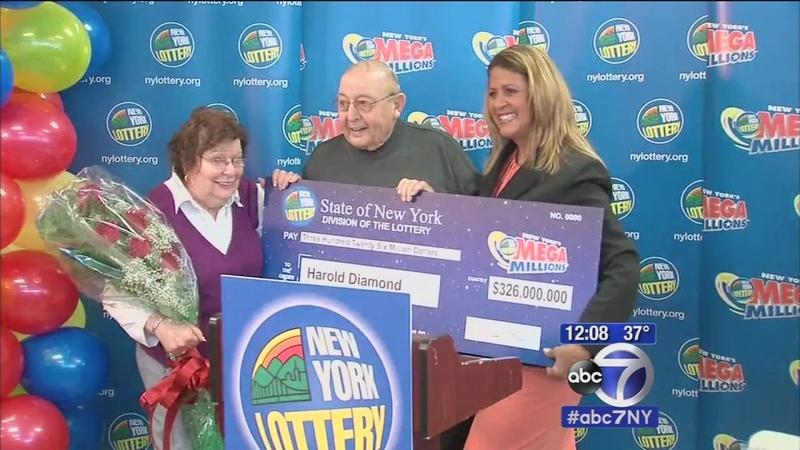 The 80-year-old from Wurtsboro is the sole winner of the $326 million Mega Millions jackpot - the biggest prize in New York Lottery history. The New York Lottery's Yolanda Vega presented Diamond with the Mega-sized ceremonial prize check on Monday. "It's very surreal to win this type of money - Carol and I are very thankful. We're lucky, we're very fortunate and grateful. We're humbled," he says. Diamond bought his $10 Mega Millions Quick-Pick ticket in early November at a Valero gas station just off Route 17 in Middletown. "My wife and I were driving to Middletown for dinner after voting on Election Day, but the weather made us rethink our plans," said the 39-year veteran of the Monticello School District, who served as Principal at George L. Cook Elementary in Monticello before retiring in 1995. "My wife insisted we stop here to eat and wait for the weather to clear, and I reluctantly agreed." Diamond noticed the Mega Millions jackpot flashing on the lottery terminal as he ate at the Subway shop located within the Valero and decided to spend $10 for 10 sets of Quick Pick numbers for that evening's drawing. "I put the ticket in my wallet and forgot about it," he said. "I went to play golf the next day and the guys in the clubhouse were talking about the jackpot-winning ticket someone bought at a Valero on Route 302 and I thought, wait a minute - I bought a ticket there last night." Irma Reyes sold the winning ticket to Diamond. "I'm just glad it's someone from around here, someone who is willing to give it back to the community," says Reyes. The retired elementary school principal and his wife, a former high school math teacher don't know just yet what they will do with their windfall of cash, but lottery officials could not be happier about the two winners, who spent their careers in education, which is where lottery profits go. Preliminary plans for the money include helping family and "giving back to the local community." "I believe he will give a lot back to the community, and that's his main passion - the local charities, the college," says former student Jared Kaufman, "he's also involved in the town where he lives - the town of Wurtsboro." Diamond wasn't the only person to cash in. Gas station owner Mike Nayfash picked up a cool $10,000 for selling the winning ticket. His financial plans? "We already took care of that with my staff; they got nice Christmas bonuses with money for selling the ticket," says Nayfash. The Diamonds plan to lay low for a week or two before deciding what to do with their newfound wealth, however one thing is set in stone - a trip to Hawaii.